I'm pretty sure that by now you already know everything about H&M Studio SS17 collection. This one is special because it was available in stores immediately after the show ("see now, buy now" concept). New Spring/Summer 2017 collection is inspired by the power of love, grace, strength and passion of ballet, featuring both womenswear and for the first time, menswear. Women's collection is a mix of feminine and masculine, with ruffles and romantic whites, as well as athletic and functional pieces with drawstrings and crinkled nylon. Pretty interesting, right? I'm in love with romantic pieces! My favourites are this blouse and the dress. They are so feminine, romantic and retro. It has ruffles, so I'm in. You know my obsession with them. Blouse is so easy to style. It looks so polished just with jeans. If you want a more polished look, you can throw on a skirt or palazzo pants. It's such a statement piece. I'm always into them. The best thing is that it’s made from organic cotton which means it's so pleasant to wear! What about you? 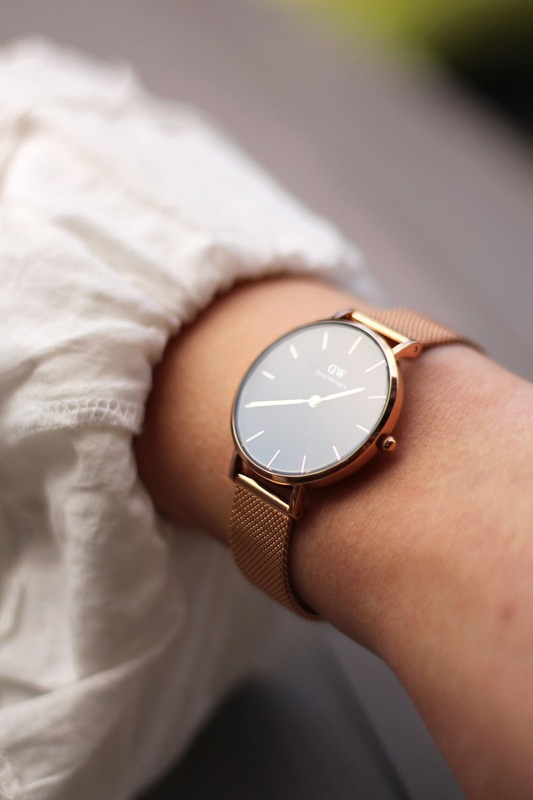 Another favourite in this post is a Daniel Wellington watch from new Classic Petite Collection. I'm loving it! I'm so crazy about gold & rose gold pieces and this is a perfect one! It goes with everything and it is so well made. If you want to buy it you can use my code for a discount, it's vukosavljevic. What is your favourite piece in H&M Studio Spring/Summer Collection 2017? Love your style! you look stunning and I love love love that coat! Babe, I love this entire look! that coat is so gorgeous and the bag as well!!! you look so chic and glam!!! I did love this blouse! I was so sad to hear that they didn't get to order in any of the collection to our stores in time for the launch. Love this coat with it too! I love that top girl! It's so romantic and on point. I love the statement collar and those bell sleeves. It really pairs well with jeans or a nice skirt/slacks. I love the way you paired it with the coat too!! I neeeeeeed this top! It's absolutely stunning. Happy weekend! I first fell in love with this look on Insta. I love how brilliantly that top pops with that jacket. It's like they were a match made in heaven! Everything about this looks screams vintage and I am all over it...the hair, shoes and blouse! You look so chic babe! Love this feminine stylish look! The H&M collection sounds very interesting, I'll be sure to check it out. I'm usually not a huge fan of frilly blouses BUT..... you changed my mind :) I can't believe it's from H&M because it looks so expensive the way you wear it! 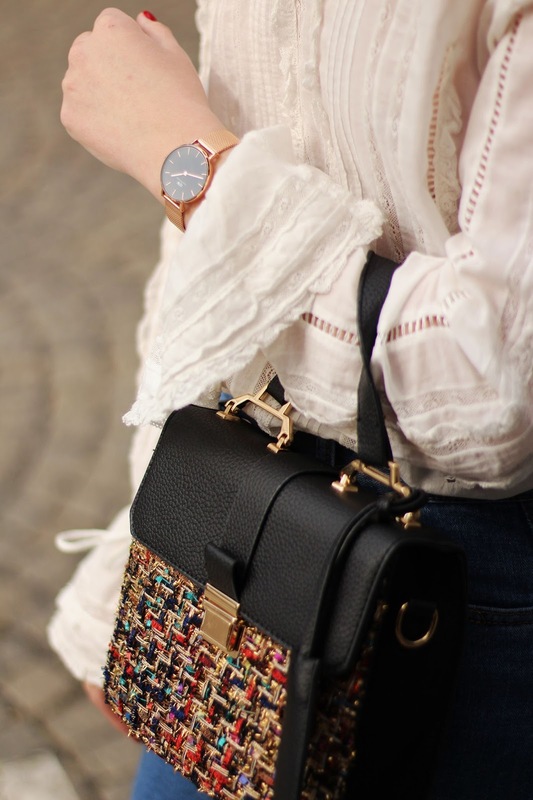 I love the blouse, bag and watch! I need to pick up that same blouse! I love how intricate that blouse is and the round collar gives it such a classy and elegant feel to it! Wow! Love everything about this look! Great work! you are so beautiful.wow,i really like the post.Its so full of good pictures and great post.You are really doing a great work.keep it up. This entire look is quite amazing and impressive! The blouse has such a gorgeous romantic vibe to it and the coat is stunning. 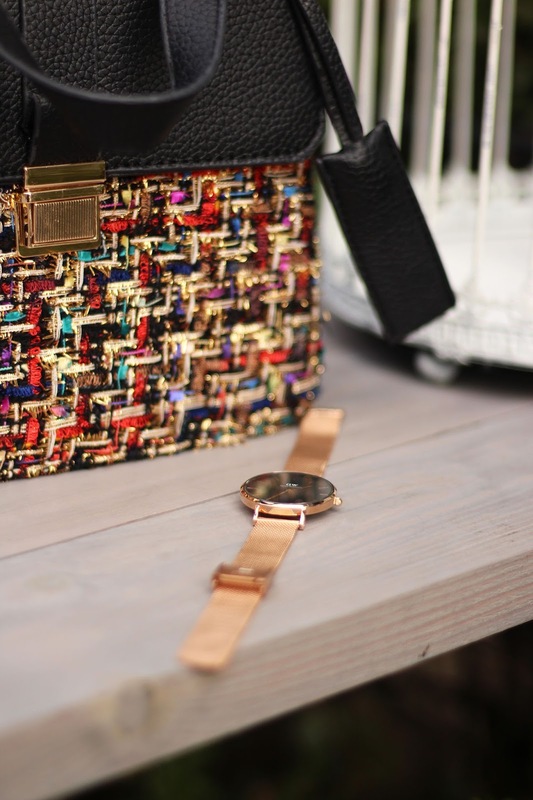 I love the colorful nature of the bag and of course the Daniel Wellington is a perfect touch to such an elegant look. you look so chic! love all the pieces especially the feminine blouse! You are so pretty! You look dazzling! I loved your dress and you are beautiful. Okay that is the cutest top I have ever seen! love it!! Totally in love with this look, you are looking so chic. I think I am in love with every single piece from this look. My favourite has to be your blouse, its absolutely perfect. I hope they bring this collection to the H&M in Singapore. I am also crushing on your shoes, they are stunning. You have used such pretty accessories to complete your look :). I absolutely love the way you styled this look! The H & M blouse and Zaful bag are fabulous! I love, love, love your look from head to toe! You look so stylish and chic. H&M did good on this collection! First of all, I love your hair! And this ruffle top is gorgeous. Obsessed with this look! You look so pretty! I am so jealous that you got to try their new collection, it is a bit different in US. even Zara doesn't offer so many great pieces as you will find in Europe. 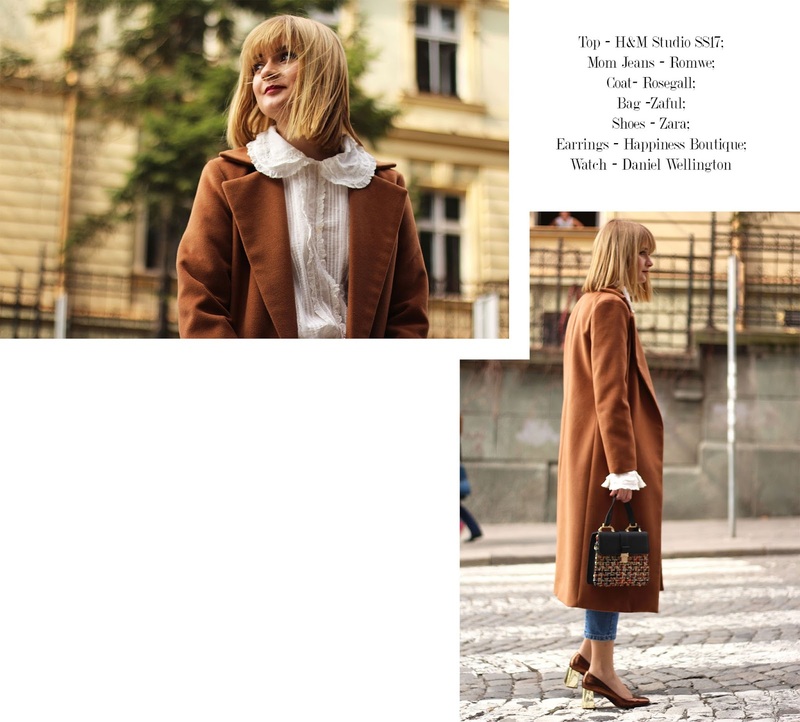 This camel coat is just perfect! I absolutely love when brands come into new ideas to make their business different and the revenue bigger. I remember when I worked in Ralph Lauren we did our first see now buy now last year and it was a completely sucess straight from the runway for the Ralph Lauren Collection show to the stores. I absolutely love this combination and specially this cute and feminine blouse. Cant wait to see more of your looks!! These are the perfect layers and I love the blouse underneath so much! I love this beautiful style! Each element coordinates perfectly! Gah! I love your style@ I'm completely in love with this entire look! I know that buy straight from the runways are usually successes! I mean for me personally I feel so inspired after a show that I obvi want it all now! lol Love this H&M collection! Beautiful outfit! Love it head to toe. Your blouse is so pretty and feminine, and that coat is the perfect piece to complement your look. It's totally chic and sophisticated. You always look incredible!! I really like this H & M Studio blouse- it's so feminine and romantic. I love the way the sleeves pop out of the bottom of your coat. I am so in love with the H&M Studio lines. This blouse is both playful and feminine, so good for layering and let the collar and sleeve details peek through. Love that amazing tweed bag too, such a great find. I'm really loving the blouse and how you styled it. The H&M SS17 collection looks great! Was that really H&M ? I thought your outfit was from a premium designer brand ;) you've made it look so stylish! Great pics! Your looks are always on the trend and feminine. Sincerelly this collection is awesome, the new line of H&M. LOVE the color of that coat and that top is amazing!! This look is so stylish, I really like it on you. My favorite part is those gorgeous sleeves. I'm obsessed with this trend. 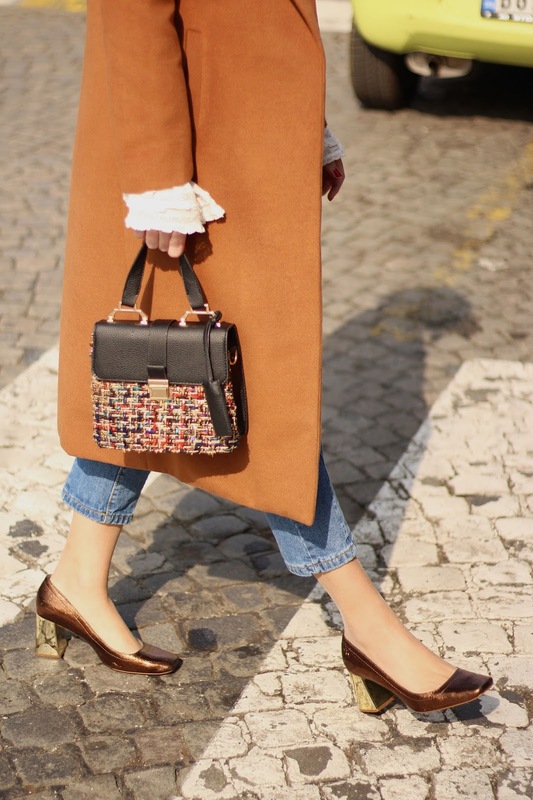 Aww, the bag is everything and fits perfectly to this coat! I love this very classic and elegant look, it's so chic and at some point old-fashioned in a good way! Your photos in this post are gorgeous and do such a great job of showing off your look! I'm really loving your ruffled peter pan collar blouse and the tweed detail of your bag, such an amazing look and gorgeous accessories! oh my goodness, this look is so chic! I love H&M and adore this entire outfit!! I sure do and I am loving it. I love how cute and chic it is. The color palette is just gorgeous. You look so spring time ready and I love it.I need to find more ruffle shirts, because I am wanting to add at least two to my closet. I also think it is time to clean out my closet. Always "Out with the old, In with the new". The "see now, buy now" thing is such a great thing! I get so obsessed with runways the wait always kills me! Great blouse, bag and coat babe! Thats a beautiful look, I love the blouse and coat paired with the denim!! That watch is so darling! I love everything about this post. Have a great one! Wow amazing! Love that blouse. I want to get it now! Loving the outfit! You have such a good eye on fashion! Why Is Important Not To Fit In?